I received a copy of Deadly Sweet by Lola Dodge from the publisher via NetGalley in exchange for an honest review. Thank you, Ink Monster LLC, for the opportunity. What first grabbed my attention on NetGalley was the cover, I mean, did you take a look at that gorgeous thing? Hello! I requested access and crossed all my fingers, toes, and eyes that I'd be granted access to this purple literary gem. And I was! I was cutting it close on the publication date but I read Deadly Sweet in two sittings and only two because I fell asleep at 3AM Saturday morning reading it. Then as soon as my errands were over for the day, I settled in to finish the final half of the book that night. And I loved it. I enjoyed my time reading Deadly Sweet, it was a relatively relaxing read with an easy to follow storyline. Anise and her fellow characters were nicely developed and they each had their own personality and tone of voice. She made some friends for the first time in years and she even managed to get a smile from the assigned bodyguard who has a perpetual scowl on his face. Most of all, Anise got to bake her heart out in that drool-worthy kitchen. Deadly Sweet was well-written and very entertaining, from the immolation at the County Fair to the Thriller dance at the sleepover. The descriptive details in Deadly Sweet were pretty good. I loved the eclectic architecture of Witch Way. I truly appreciated how Ms Dodge showcased the eternal bonds of true friendship between Nora and the friends she'd lost contact with 20+ years ago by passing them on to the trio's children, Anise, Blair, and Gabi. I could tell that Lola Dodge put a lot of her own experience into the culinary aspects of Deadly Sweet, nobody knows the baking world better than someone who's actually been there and done that. I fell in love with Agatha's kitchen and would love a chance to cook up one of my special recipes, maybe my chocolate bourbon pecan pie with a good fortune spell slipped in with the caramel? What I didn't like is that Gabi is introduced as this friendly and bubbly girl and it seemed that the author was building up for Gabi and Anise to become bosom buddies but then, she pretty much disappeared for most of the book. I'm hoping that Gabi has a more active role in the sequel. It was rather obvious to me who the Big Bad was but I enjoyed Anise's journey to discovering what I already figured out. It was like watching one of those cheesy horror movies where the entire audience is telling the vacuous blonde not to go investigate the creepy basement alone. I found myself yelling at my kindle at two in the morning, telling Anise not to do the thing that will probably kill her. I enjoyed Deadly Sweet and I look forward to reading its sequel when the time comes. But throughout the book, there was also something missing, and I know not what, that made me incapable of falling truly madly in love with the story. All in all, I'm going to give Deadly Sweet 3 out of 5 stars. I'm totally going to buy it and reread it in a few months, but it's not a contender for my Top Twenty Literary Loves. Check out the Deadly Sweet Blog Tour! 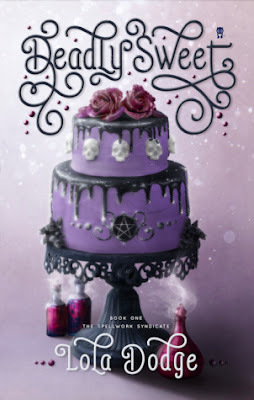 I know this review isn't as in-depth as my others, but I've been dealing with a nasty little bug this week and I still wanted to get Deadly Sweet's review out for its book birthday. So, please don't hate me for the short review. Until next time, darling readers, have a happily ever after! And if anybody knows how to get me some bake time in that kitchen, let a girl know! Well, baking cakes now days is a big thing. It can be a matter of life and death for some people. I just attended a fest in venue NYC and saw some amazingly designed and delicious cakes. I was not ready to leave that place, trust me! It was like heaven for me.